GAZA CITY, Aug 16 2014 (IPS) - “My child became blind and lost the ability to speak, his dad died and his three brothers are seriously wounded. He still has not been told about the loss of his dad,” says the mother of 7-year-old Mohamad Badran. 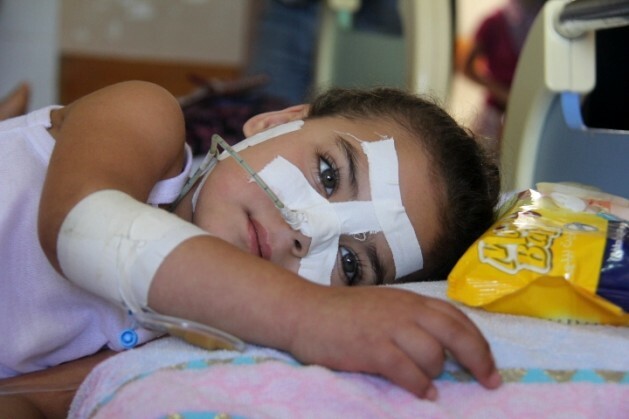 Mohamad is in hospital for treatment after being seriously injured in Israel shelling of Gaza. “My only way to communicate with him is by hugging him,” his mother adds. Israeli air attacks and shelling in Gaza have left more than 1,870 dead and thousands injured. 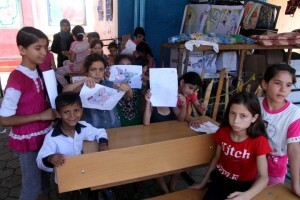 They have caused damage to infrastructure and hundreds of homes, forcing a large number of families to seek shelter in schools run by the U.N. agency for Palestine refugees (UNRWA). Some of the children have suffered serious injuries which cannot be treated in Gaza due to the limited medical infrastructure and capacities caused by the Israeli blockade. In a news note, the U.N. Children’s Fund (UNICEF) said that Israeli airstrikes and shelling have taken a “devastating toll … on Gaza’s youngest and most vulnerable.” It said that at least 429 children had been killed and 2,744 severely injured. Some of the children injured have suffered serious injuries which cannot be treated in Gaza due to the limited medical capacities caused by the Israeli blockade. According to UNICEF, about 400,000 children – half of Gaza’s 1.8 million people are children under the age of 18 – are showing symptoms of psychological problems, including stress and depression, clinging to parents and nightmares. ”We have a moral responsibility to protect the right of children to live in safety and dignity in accordance with U.N. charter for children’s rights,” she added. However, the acute psychological effects of the Israeli attacks Gaza that have emerged among children, such as loss of speech, are among the biggest challenges that face psychotherapists. Throughout the Gaza Strip, where entire neighbourhoods such as Shujaiyeh and Khuza’a have been destroyed by the Israeli invasion and heavy bombardment, access to basic services is practically impossible. People in these areas have been suffering difficulties in accessing drinking water and have been living in an almost complete blackout since the Israeli shelling of the power station which was the sole source of electricity in besieged Gaza. Social Watch– a network of civil society organisations from around the world monitoring their governments’ commitments to end poverty and achieve gender justice – Thursday called on the international community to declare the Gaza Strip an “international humanitarian disaster zone”, as requested by Palestinian NGOs. “The unrestricted violation of international law and humanitarian principles adds to the instability in the region and further fuels the arms race and the marginalisation of the issues of poverty eradication and social justice that should be the main common priority,” said Social Watch. “The recurrence of these episodes in Gaza is the result of not having acted before on similar war crimes and of not having pursued with good faith negotiations towards a lasting peace,” it added. In the current disastrous situation in Gaza, it seems not only that the burnt bodies of Gaza’s children are the heritage of war, but also that their educational and health future is being burned.